It is precisely this attitude that the Apostle Paul has adopted in his address to the Philippians. Paul has looked on his circumstance-being imprisoned for the Gospel-and instead of bemoaning his what had befallen him, instead he rejoices. Certainly both those who arrested him and were holding him for trial and those who used his imprisonment as a means to assert their own leadership in the church over and against him meant his harm. Yet, the Apostle can only see how even this suffering he was enduring was used to proclaim Christ. When we come into faith in Christ Jesus and we behold the wonder that is our salvation by grace alone, the Gospel takes center stage in our life. The hope we have begins to lead us to proclaim Christ to others and to view the entirety of our lives in service to the Gospel. No matter what befalls us, no matter what occurs, no matter the circumstance or situation, God is working to proclaim the Gospel of Jesus Christ through us. Who needs Jesus in your life? Proclaim the Gospel then and trust that everything in your life is leading you toward that end. And when we see the Gospel proclaimed, no matter the outcome, we rejoice that the truth has been shared. Cookies, cookies, cookies: Coffee Fellowship could use some cookies. Please put them in a ziplock bag labeled with the date and drop them into the freezer. It is not too late to buy a highly-fragrant, long-lasting candle from one of our youth. This fundraiser supports our annual camp ministry. Please check the Lost & Found box for items you may have left. The day is coming and will soon be here when items in the box will be donated to the Senior Center. Men's Breakfast is coming up on October 8 at 6 am. 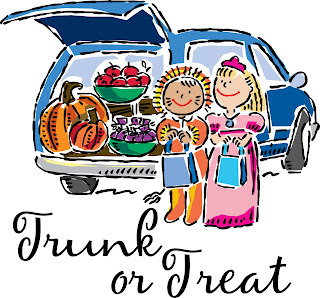 Trunk-or-Treat: On October 31 from 5-7 p.m. our parking lot will be hosting a Trunk-or-Treat event. 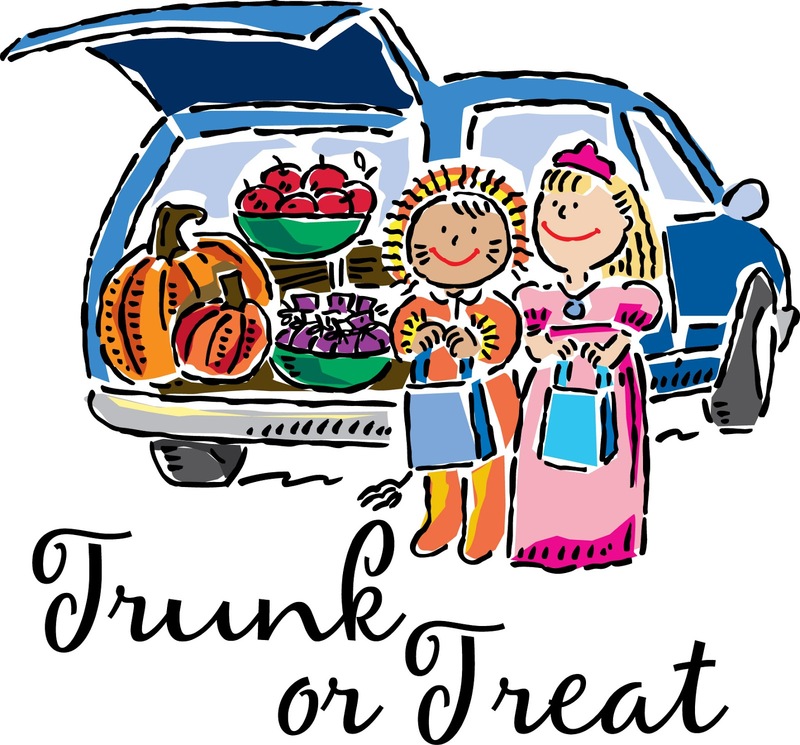 At a trunk-or-treat people decorate cars and dress up in a theme to hand out treats to kids. It is a good opportunity to meet people and invite folks to worship. We are in need of folks to provide the trunks. More information will be forth coming from the Service Team. Starting this week our blog devotionals will be following the Sunday School schedule. This week our Sunday School class covered Philippians 1:1-2 and so this will form the basis of our devotion. As Paul began his letter to the Philippians he wrote, "Grace and peace to you from God our Father and the Lord Jesus Christ" (1:2). [The video here is an artistic rendition of this idea by Fernando Ortega] This is the Apostle's standard greeting in his letters to the churches, but is particularly poignant in this letter. You see Paul was writing this letter from prison (most likely Rome toward the end of his life). He had received a gift of financial support from the Philippians that led him to reflect on thankfulness in this letter even as he gave thanks to God and the Philippian Church for providing for his need. Of all the places where we can think that grace and peace are needed, surely being imprisoned for one's faith must rank high on the list. Yet, Paul is not asking for peace and grace for himself, but rather he is offering grace and peace to the Philippians from the inexhaustible richness of the grace and peace of God that is ours through faith in the Lord Jesus Christ. What's more, we know from Acts 16 that Paul had not experienced much peace during his time in Philippi, but there was plenty of grace. Indeed, Paul was imprisoned there and through his faithfulness to God's call and a miracle the warden of the prison and his family came to know salvation through the grace of Jesus Christ. Now, far removed, imprisoned and impoverished for the Gospel, the Apostle takes time to offer that which he has in abundance, namely, grace and peace from God the Father and the Lord Jesus Christ. This stands as a ready reminder to us today that we are called to be agents of God's grace and peace. We have received the favor of God through the saving work of Christ Jesus and this has made peace between God and us and leads us to make peace with others. Take time today to give thanks to God for the grace and peace you have received and then offer that grace and peace from God our Father and the Lord Jesus Christ to someone else. Is there a relationship you can mend today through apology? Is there a note of encouragement you can send someone? Is there a friend who is struggling with whom you can share the life-giving Gospel of Jesus Christ? Can you spend time with your family in God's Word and demonstrate the peace of Jesus Christ through confession and prayer? Grace and peace are a gift we have from God, but they are also a gift we have been given to share. Thanks goes out to Kurt and Jennifer Fudge for our first Middle School Youth Group outing. The kids had a great time kayaking. A great big shout out to our small group leaders (Lyslea, Chris and Becky, Dave and Stephanie, Kathy, and Ron and Randi) who begin leading us through 'Experiencing God' this week. A welcome back to our Church Administrator, Dave Bishop, who has returned from his mission trip to Lebanon and is recovering from an illness he received while traveling. To Adam's Road for an uplifting time last night. [If you missed it, check out Micah's testimony in the video above]. Helpers are still need for our Children's Sunday School program that happens during worship. Pastor Bill could use some help contacting other congregation's regarding the Rotating Shelter ministry. We simply could use another congregation or two to help carry the load as we serve the homeless in our community this winter. Keep an eye out for visitors at CPC and practice hospitality. A kind word and an invitation to lunch or supper can make our church a very friendly and welcoming place for all. Sunday School Remix starts today. It will run Wednesday afternoons 2-3:30ish for the school year. This year we will be studying the history and theology of the early church leading up to the completion of the Nicene Creed. Potluck Sunday will be this week. Be sure to bring a dish to share at our Western Round-Up Potluck. Bell Choir will start practicing soon. Check the bulletin for details this week.